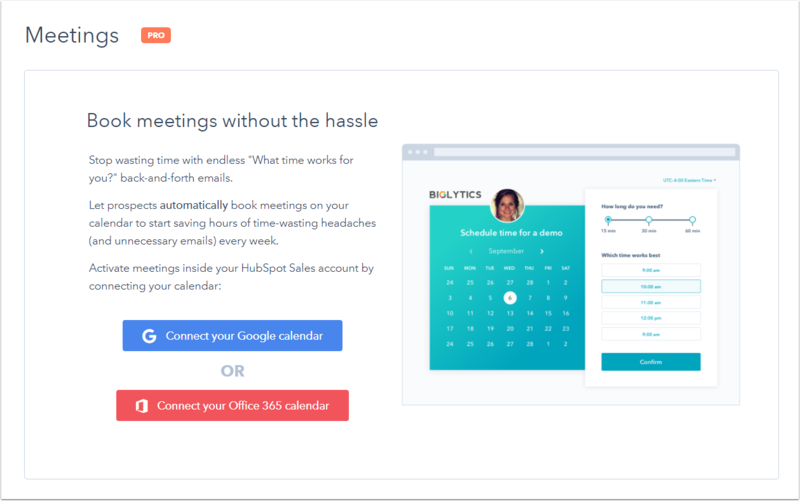 With the meetings tool, you can connect your calendars with HubSpot, then your prospects can book a time that works for both of you, without the back-and-forth of email. In this article, learn how to connect your calendar and configure your meeting settings. Once you've set up your meetings tool, learn how to create a meetings link. Connect your Google or Office 365 calendars with the meetings tool to allow your calendars to sync to HubSpot. If you have an event on your connected calendars, the meetings tool will show that you're busy during the event time. In the left sidebar menu, navigate to Sales > Meetings. Check if your email provider is compatible with meetings. Click Connect your Google Calendar or Connect your Office 365 calendar. When prompted, click Allow to give the meetings tool access to your calendar. 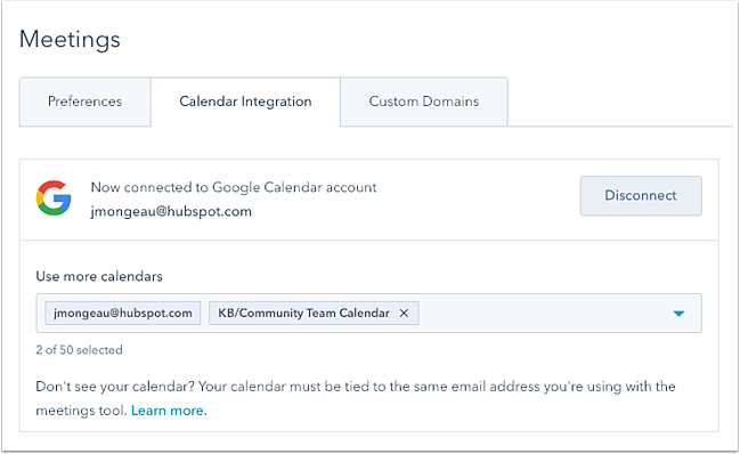 If you have not connected your inbox to HubSpot, connecting a calendar to the meetings tool will also connect your inbox in your email integration settings. However, once your calendar is integrated, you can disable the inbox connection without disabling the calendar connection. If you have connected your inbox as a shared inbox, your calendar cannot be connected with the meetings tool. Only personal inboxes can be connected to the meetings tool. Click the Calendar Integration tab. 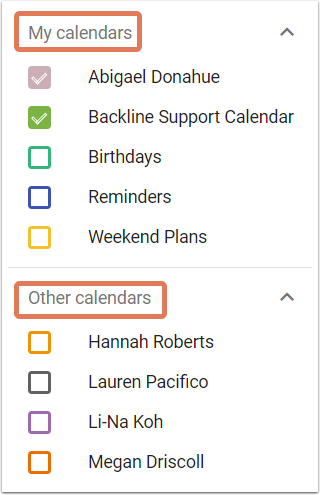 Click the Use more calendars dropdown menu and select any additional calendars. You can only add calendars that you either own or that your email address has access to in your connected Gmail or Office 365 account. Learn how to set up new Google calendars and new Office365 calendars. Your meetings tool will automatically prevent clients from booking meetings during any events that are set to Show as Busy on your integrated calendars. When a prospect books a meeting with you, the meeting event will only appear on your personal default calendar, not your other integrated calendars. Please note: if you have enabled the Google Calendar or Office 365 Calendar two-way integration with HubSpot, when you create a calendar event with a contact directly in Google Calendar or in Office 365 Calendar, the event will sync to the CRM as a meeting engagement. With this two-way integration, meetings created directly on a contact record in the CRM will send actual calendar event invitations to the contact. Without your calendar connected, it will strictly just create a meeting engagement on the record. In the Meetings URL field, customize your meetings URL. Changes to your meetings URL will apply to all new links going forward, but will not change existing meetings links. Select your default meetings link from the Default meeting link dropdown menu. In the left sidebar menu, navigate to Account Defaults. Company info: enter your company information. Logo: edit the logo that will display on your meetings booking page. Colors: use the color pickers to select an accent color for your meetings booking page. 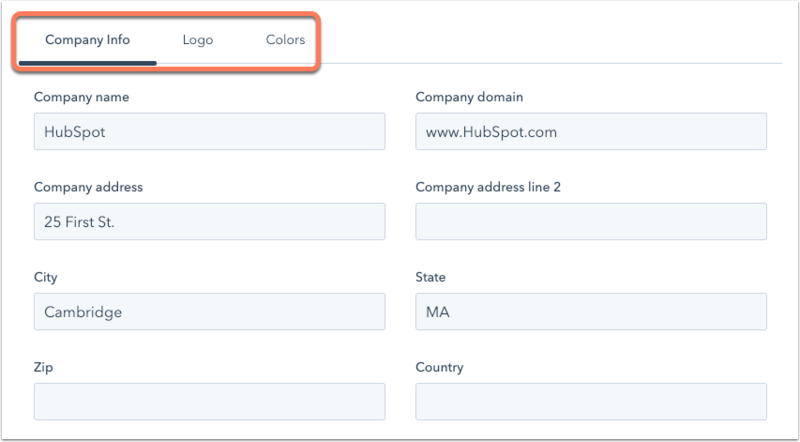 If you're a Marketing Hub Professional or Enterprise user with Read access to content features, use your own custom domain instead of app.hubspot.com in your meetings link. Click the Custom Domains tab. 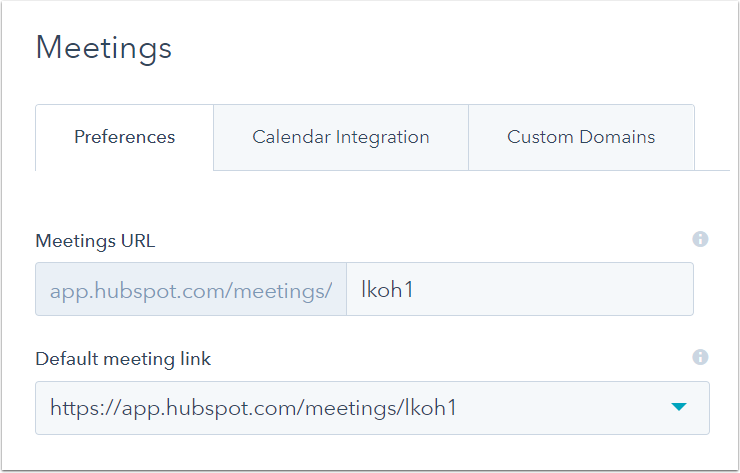 In the Meeting domain dropdown menu, select a custom domain to host your meetings links on instead of a HubSpot address. Only domains that have been connected in your domain manager will appear in the dropdown menu for selection. Please note: if you're using a custom domain, the URL still needs to have a different slug than existing links on other domains. 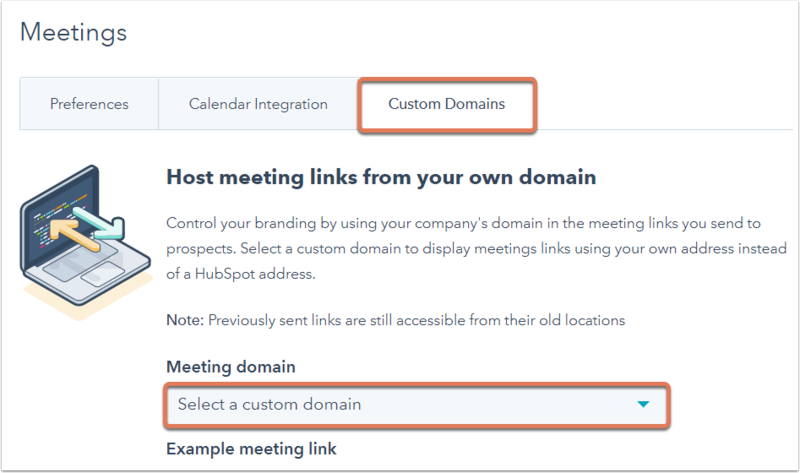 For http://yourcustomname.com/meetings/example and http://app.hubspot.com/meetings/example are considered the same, so you wouldn't be able to use http://yourcustomname.com/meetings/example if http://app.hubspot.com/meetings/example already exists. Even if a meetings link uses a custom domain, you cannot use the same slug as a link on a non-custom domain.